Twenty eight page issue of the NCAA's official publication. 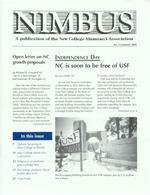 publication of Open letter on NC growth proposals b.IJ Michael H. Campbell '87. Ale..risA. Simendinger '75 and Lawrence W. Vernaglia '87 Does the ize of the student population make a difference? Histori cally, proponents of dramatic growth at New College were shy about publicly advocating how big or how fast. But President Gordon "Mike Michalson put the question quarely before the ew College community in hi September 2005 State of the College report, writing: "I believe an ultimate figure of between 1,000 and 1,200 students continued on p. 2 In this issue 7 Options for giving to ew College of Florida 11 ew College alums save civi I ization 13 Influential art professor Jack Cart l idge dies 17 Psychology professor David Smillie dies at 81 21 C lass Notes oil g Alutnnae/i As ociation No. 53 Summer 2006 INDEPENDENCE DAY NC is soon to be free of USF by Jono Mille r '74 As you may know or remember, on December 9, 1974, title to the New College campus was transferred from New College to the State of Florida. My favorite graphic from the era was an er twhile Univer ity of South Florida consumer contem platively holding (or po sibly shak ing?) a box labeled New College with a thought bubble along the lines of "I wonder what's in here?" USF may still be wondering, but barring unforeseen circumstances, USF and USF Sarasota-Manatee this summer will relinquish all interest in property on the New College foot print, ending an 11,500-plus-day experiment dUling which USF, and not New College, held ultimate authority regarding the campus. But, hey, who's counting? continued on p. 4 Worker8 apply.finishing touches to nero USF campus, just up U.S. 4-lfrom ew College. New College and USF: Conjoined twins should lead more meaningful lives after separation continued from p. 1 That footprint is no doubt different than the one you recall. Over the years New College has added the Zinn's triangle and the former Circus Hall of Fame site as well as several house on 58th Street (south of B Dorm). But the college has let go or traded away the historic bookstore southeast of University Parkway and U.S. 41, all the HoJo's or Viking property along the west side of 41, and the Manatee County portion of the Uplands bay front, which links the area north of the Bonseigneur house with the Crosley estate. Our portion of the Uplands bay front will still be under orne joint management with USF, which to date has meant no real management other than mowing the grass and some exotic plant removal. This transfer has been made pos sible by the relocation of USF to the Cro ley Campus, an unlikely tale that involves, among other thing such disparate elements as the man who first thought to put shelves on refrigerator doors, the idea for a water theme park, a remnant popu lation of gopher tortoises and a con tentious legal challenge to the relo cation. The separation of USF Sarasota Manatee from New College has been compared to a divorce, with the situ ation-comedy twist that the estranged coup l e still shared an apartment. The show ran for five years, full of all the predictable tiffs, lovable high jinks and embarrassing situations one might expect. Who can forget the "Culture Clash" episode not so long ago when USF scheduled a big bash with '70 rock ers Three Dog Night for the same evening as the Halloween PCP? You 4 IMBUS Summer 2006 remember Three Dog Night: "From 1969-1974, nobody had more Top 10 hits, moved more records, or sold more concert tickets." Momma told me not to come, indeed! USF Sarasota-Manatee will still have access to Cook Library, Sudakoff Centel/ and campus recreational facilities. Despite the immense popularity of the awkward divorce model, I've personally grown increasingly fond of the analogy in which USF Sarasota and New College are seen as con joined siblings who would lead more meaningful lives apart-if only the realities and exigencies of divvying up shared organs can be accom plished. Delicate surgery is called for. The reality is that, even after surgery, New College of Florida and USF Sarasota-Manatee will continue to hare at least three-and maybe more-organs. USF Sarasota-Mana tee "'ill still have access to Cook Library, Sudakoff Center and cam pus recreational facilities. In addi tion, discussions are ongoing (as of April) about the possibility of con tinued shared-service agreements regarding the Cop Shop. But such offices and departments as the Copy Center and Information Technology have been split off, with each institu tion fielding its own, more modest, incarnation. For optimists, New College's Golden Age tends to be a rolling average that coincides with their tenure here; for pessimists, it i either the era immediately preced ing or following their stay. As for my elf, an optimist, I ha,e always pre umed I caught the last flight out before the border closed. My 1974 diploma makes no mention of USF, a fact of which I've been most proud. But here's the kicker. Thir ty-two years out of NC, I've applied to a ma ter's program: Florida Stud1e at the St. Pete campus of ... USF. Jono Miller is a 1974 New College graduate, a director of the Environ mental Studies Program, a former alumnae/i association president, and adviser to the vice president for finance and administration about matters related to campus planning. A princess, a witch, a mermaid and a merman were among the l:JO NCF .<;I ude n ts recehi ng at the sclwo/:<;J,.Oth annual commencement Ma.IJ 19. Roewert remembered as charming, studious continued from p. 19 Following graduation thi May, he hoped to travel to France, where he planned to travel the French coun try ide by bicycle and hone his cooking and travel \\Titing skills. "John lived his life more fully in 24 years than I could ever hope to;' said his father Raymond while fighting back tear during the serv ice. "I can proudly say that we were more than just father and son; we were be t friends." Roewert's mother, Rochelle, and numerous childhood friend and family members from the Clearwater area also attended the ceremo ny Many of them, along with stu dents and faculty from New Col lege, shared tbei r memories of John's life. "John Roewert was one those men you meet and you just know you have met a masterpiece of a human being;' wrote his friend Marina WiUiams '02 in a remembrance for Nimbus. "A charming personality, studiou mind-set, and with dance moves that would make any man jealous and any woman want to kip a trot with tbi jack-of-all-trades, Mr. Roewert was one of a kind. Always adventurous, be traveled through Spain on a pilgrimage, had brushes with fame in the Big Apple as an actor, and was famou for wearing a brown jacket, telling corny jokes, and calling his father Pop The charisma of such a dynamic friend to New Col lege and the world at large will never be forgotten.'' In his honor, and at the request of Roewert's family, New College ha established the John Roewert Memorial Fund to support theater and drama programs at the college. For information on how you can contribute to the fund, please contact the New College Foundation at 941-487-4800. Checks and money orders for the fund may also be sent directly to the foundation at the fol']ohn Roewert lowing address: New College Foun dation, John Roewert Memorial Fund, 5800 Bay Shore Road, Sara sota, FL 34243-2109. David and Anna Smillie's graceful dance recalled continued from p. 19 is of another side of David, the David who loved life, loved his family, loved Anna. I remember a warm evening under the stars and royal palms at New College. It was a midterm party, which at New College was always a bit more Bacchus than Bertrand Russell. Rock music burst through the speakers as a couple approached the edge of the dance. Elegantly untouched by events around them, he offered hi arm. She accepted with a nod barely perceived by any one, save them. Their hands lightly touched. He held her gently at the waist; she rested his shoulder with 20 li\1BUS Summer 2006 her fingertips. Moonlit, they danced acros the water of the courtyard, their long necks graceful in the night, a dance of swans. Their wake rippled among us. We were drawn to their private symphony, though we could not hear. When their music opened to silence, he offered his arm once again. They walked from the courtyard into the embrace of night. David never believed in life after death. He held to the idea that there was nothing beyond these few moments of consciou ness. But when we last talked I told him I believed that eminent scienti ts are tho e who unlock the great and sub tle mysteries I encouraged him to take the attitude of an empirical sci entist when he experienced the deep est mystery of all. We talked about the openness to scientific progress that characterized our lives, and how that intellectual attitude might be a bridge for him soon. Not a belief but an experience. Not a theory but an event. He pointed to hi fingerboard: "Good Always open to our di cu sion of alternatives, even when he held a firm belief. Just a day or o ago, as I was missing my dear friend, I thought I heard him say in a voice younger than I am now, ''Don't be sad, teve, for it is, after all, rather glorious." CLASS NOTES (CONTINUED) i ng to co n centrate i n environmental and publi c int e rest law." 2001 Rachel johns '01 is l iving in N ew York and wo rkin g as a p aralega l "wh i l e fin is hing up m as age lice n ejposs ibl e cos meto l ogy or r e al estate l ice n se Sh e i s "volu n t ee rin g a t a m u se um and t ryi n g to figure o ut a ca r eer ver u ju t a job fo r m yself a n d would l ove t o m eet up wit h other alum s in th e a r ea R aea H icks '01 wri tes, H ello Everyo ne! I' m curre ntl y r es idin g in Lo AJan1os, m a k i n g pl a n s to bl ow u p t h e world ... J / K I'm r eally a c h e mist ry technici a n (i.e p eo n ) i n b e t wee n h ere and gradu ate sc h ool. G ive a h o ll a i f you 're in northe rn ew Mexi co!" Eris Budzin ki '01 writes, "As of the 2006 ew Y ear, I'm wo r k i ng at th e U.S.-Russ i a Bus in ess Coun cil in D.C. I a m a l so l iv in g at h ome for t h e first t i m e in seve n years." ew Co ll ege Alumnae/ i A ssociatio n New Co ll ege F o und a t ion, Inc. 58 0 0 Bay S h o r e R oad Sarasota, F L 34243-2109 28 NIMB U S Summe r 2006 David Slavkin '01 se nd s hi s address. A tt e nti o n : Teacher D a vid Slavk i n 158861 KNC Ilyunjae In t i tute 1015-7 K e um wa n g Bld g., 3rd floo r Shin jeo n g 1 d o n g Y angc h eo n gu, S eo ul o uth K orea. justin Clark-Doane '01 i s a PhD student i n p hil o ophy a t NYU. H e w r i t es : "What h a ppe n s a t ew C ollege tay at ew C o ll ege 2002 Brian Claeys '02 is c u rre ntl y livin g in Y a ngzh o u Provin ce, China, teac hin g E n gli h to kind e r garte n stud e nts. 'illly al u ms livin g in t hi s p a rt of Ch ina s h o uld feel free to contac t me." 2003 Michelle Krasowski '03 a nd Christopher Gray '03 we r e m a r rie d o n M arc h 1 8 in arasota. Th ey live in Sa raso ta. 1 onprofit Organintion U .S. Postage Paid Permitll500 Manasota FL NIMBUS Published by ew Col lege A l um nae/i Association, New Col lege Founda t ion, 5800 Bay Shore Road, Sarasota, FL 34243-21 09; tel e phone 941 -487 -4900; a l um@ncf .edu; www.new o ll ege.org Editors: Susan Burns ('76) Chery l Hoffman ( 65) a n d Law r ence Paul son ('65) U nless ot h e r w ise n oted, opi n io n s expressed a r e those of t he autho r s and do no t repr esent officia l pol i cy of the A l umnae/i Associa t ion or the opinions o f t h e editors Nimbus l ogo desig ned by Elaine Simmons ew Colleg Foundation, Inc. i s an inde pendent not for-profit rlorida corporation that has been qualified by the federal Internal Revenue Service as an IRC 501 (c)(3 ) organization. The IRS has also determined that ew College founda tion, Inc is not a private foundation within the m aning of 509(a) of the Code The tax-exempt status of ew Col lege Foundation Inc. has not been revoked or modified ew College Foundation Inc is listed as a qualified organi zation in IR publication 78 (R('viscd Sept. 30. 2000), Cumulative I i I of Orga nizations, Catalog umber 70390R page 852. A copy of the official registration and financial information may be obtained from the Division of Consumer Services by c alling toll free 1 800 4 357 352 within the tate Regi tration does not imply endorsement approval or rec ommendation by the State. S111ce ew College foundat1on does not engage pro fessiona l solicitors 100 percent of all gifts a r e received by the Foundation The State Registration umber for ew Col lege Foundation is C-00206 The federal IRS Identification umber is 59-091 1 7 44. imbus is published t hree times a year Susan Burns, Cheryl Hoff man Lawrence Paulson, Editors ew College Alumnae/i Association 5700 Tami ami Trail Sarasot a FL 34243-2197.